The variety of colourful gems is almost limitless. Some of the most popular ones have been allocated to months of the year; bringing all people born in their months under the protection of that stone. Pls note that Birthstones can vary throughout the world. Here’s the NZ list, as published by the JWNZ. Are you having trouble finding the correct size for your engagement ring or wedding band? Measure your ring online or match your ring to our printable ring size chart. We use the UK sizing standard in NZ. Use this conversion chart to match your size. I live far away, can I order online? Yes, with all this technology at our finger tips I find it very easy to communicate and complete the design process via email/web. I can then update you with process pictures during the making of your piece. I have many happy customers from all over the world. 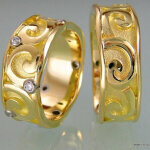 Platinum, White Gold, Yellow Gold, Red or Pink Gold, Palladium or Silver. What is a custom / bespoke piece of jewellery? 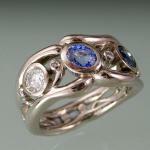 The process of choosing a custom made piece of jewellery is to have the piece created to your exact requirements. The design style, types & colours of metals and the exact stone(s) you might wish to have are chosen by the customer. There are various different methods of setting and styling that will impact on the weight, all these can be maximized to your budget. The final piece will be UNIQUELY YOURS. No one else will ever have exactly the same. I would like to propose with a surprise engagement ring. Can you help me? Of course, I’d be delighted. A surprise proposal with a ring is a fantastic way to ‘ask the question’. There are many ways to go about doing this to ensure the correct ring is produced. I have successfully helped many customers do this. And your ring can be discussed, made and delivered in the strictest of confidence to ensure your surprise. There can be a general misconception to believe that you have to pay a premium for custom made jewellery. At Orbit jewellery this is simply not true. Because we produce your piece according to your design we can select the “ingredients” to match your budget. 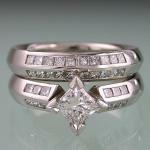 This can mean substantial savings because you are not paying overheads for stocked diamonds or finished rings etc. Prices are entirely dependent on the cost of the materials used within Juerg’s work, and a firm quote can be given once he knows all the details of your individual requirements. All of Juerg’s jewellery is made to order especially for you. Commissions can take up to 6 weeks from sketches to final delivery. However, most pieces will be completed in a much shorter time. It is best to contact Juerg well in advance of your deadline. Prices are entirely dependent on the cost of the materials used within Juerg’s work, and a quote can be given once he knows all the details of your individual requirements. Payment can be made by electronic banking, international bank draft in NZ dollars or by credit card. Your order and non-refundable deposit payment, to cover cost of materials, constitutes your agreement to buy. Our confirmation on receipt of this payment constitutes our agreement to sell. The piece will be released to the client when payment has been received in full. The intellectual property, including copyright and ownership of all designs and drawings of or in the piece(s) remain with Juerg P. Muff of ORBIT Jewellery at all time. As a customer you acknowledge and agree not to reproduce any piece(s) without the express written authorisation of Juerg P. Muff of Orbit Jewelllery. However if you wish, you can obtain your very own drawings. You are responsible for paying any duties or taxes imposed for customs or importing goods into your country. If in doubt, check with your post office or customs office. Engraved, Special, Bespoke or Custom Orders are final and cannot be exchanged or returned. Exceptions might be for some sizing & minor modifications like surface finishes, and solely at the discretion of Orbit Jewellery if such could possibly be applied to the item in question. All of Juerg’s jewellery, including webshop pieces, is made to order especially for you. Most pieces will be ready to ship within 10 working days, some even in a shorter time. Custom engraving options may add another 10 working days to an order. It is best to contact Juerg in advance of completing your order if you have a very important deadline ahead. We will do our utmost to accommodate your request. All webshop orders will be charged in NZD. After ordering online, you will receive an email confirmation containing your order details (if you have provided your email address). We will normally confirm receipt of your order within a few minutes of ordering. We will attempt to send your goods via Insured Courier within the above mentioned time-frame; however if goods are unavailable delivery might take a little longer. This refund policy does not apply to jewellery and/or gemstones that have been worn or used, damaged after delivery, or if any attempt has been made to alter the product or if they have been dropped or broken. All jewellery and/or gemstones must be returned in their original condition. All postage and insurance costs are to be paid by the buyer. We recommend that you return the product via insured and trackable courier such as DHL, FedEx etc. You assume any risk of loss, theft or damaged goods during transit. You will be responsible for parcels lost or damaged in transit if you choose not to insure. After you have explained the problem to us by email, we will issue a Return Merchandise Authorization (RMA) number if necessary. Once we have safely received your package we will refund the cost of your purchase less our original shipping cost. We reserve the right to not accept a return and may require a restocking or repair fee if the item has been damaged or requires alteration. High value returns may also incur a Customs Clearance charge from the New Zealand Government. We will have to deduct this fee from any refund in the case of a return or add it to the reshipping charges for a resized, exchanged or modified piece. Our webshop uses either PayPal or eWAY Payment gateways for its online credit card transactions. These process online credit card transactions for thousands of New Zealand and worldwide merchants, providing safe and secure means of collecting payments via the Internet. All online credit card transactions performed on this site are secured payments. – Your complete credit card number cannot be viewed by us or any outside party. – All transaction data is encrypted for storage within bank-grade data centres, further protecting your credit card data. Once work has commenced on a Special or Custom Order it cannot be cancelled. All other orders may be cancelled if we receive your notification before the goods are shipped. Unless you expressly in writing inform Juerg P. Muff of Orbit Jewellery that you do not agree to these terms, you will automatically be taken to understand and agree to them. Thank You.